Because we use the Hale M.R.I. every day in our propeller shop we are continually developing new features that are added to the software. Additionally, input from our customers has also resulted in new functions that are included with our software upgrade releases. Among the assets of modern computer programming language is the ability to make programming changes readily.Hale M.R.I. software has multiple data analysis Tools each designed toward one objective Accurate Propeller Repair. The first several data tools are designed for and presented to the propeller technician. A detailed layout of each blade in multiple radii with several hundred interrogations per radius as well as the computed mean for each radius provide the technician with a detailed image of each blade. Point to Point Position, Blade Segment Analysis and Section Plot Graphs for the entire wheel are available in both numeric and graphic formats. This detail provides the repair technician with an accurate picture of not only how much each blade is out of specification but also WHERE. As the repair process proceeds the Hale M.R.I. may be used to document and analyze the progress.The Hale MRI will even compare one propeller to another in graphic and numerical formats. The technician can compare port to starboard, a replacement wheel to an existing wheel or any wheel to any other wheel.The Hale MRI also has the ability to compare the propeller to factory design files.At the completion of the repair a report is printed that can be presented to the customer. The data is presented in a concise manner that is designed to be understood by the boat owner. (Sample Reports)The "Import" / "Export" tool allows all of the data to be transferred from anyHale MRI to any other Hale MRI. A distinct advantage to the cruising boat owner. Their analysis may be transferred via e mail, direct data transfer or on disk, insuring that their wheels are repaired to the same configuration even when away from home port. 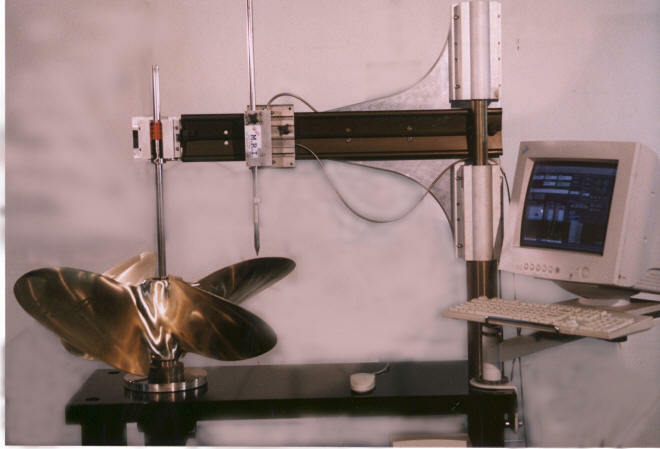 In order to provide maximum stability and to insure that all critical measurements are derived from a constant reference the Hale Propeller MRI is built upon a 1½" thick solid steel table bed supported by 2" welded steel legs. The radial spar assembly is fixed between two precision ground masts to eliminate unnecessary deflection. Due to the strength and rigidity of the platform assembly and its center of gravity, propellers up to 50 inches in diameter and up to 500 pounds may be safely and conveniently measured.The rotating portion of the table assembly uses bearings of such capacity and tolerance that any propeller is easily rotated by the operator with almost no effort. The entire electronic interface to the computer is accomplished through a specially designed dedicated single printed circuit board (PCB). This PCB is integrated into the computer via one of the computer's expansion slots. Not only does the PCB provide all of the data interface to the MRI but also supplies power to the system. No additional power supplies or cables are required. Following data collection all mathematical and analysis functions are performed within the proprietary Hale MRI software with simple "point and click" commands.